In a small bowl, stir together cake mix and applesauce. Fold the cinnamon in just slightly, so ribbons of it are swirled into the batter. Spoon half of the batter in the bottom of a mug sprayed with nonstick baking spray. Spoon 1 1/2 tablespoons of cream cheese frosting on top of the batter. Top with the remaining batter. Microwave for 1-1/2 to 3 minutes. The cake is done when the top springs back when touched lightly in the center. Place the remaining icing in a ziptop baggie. Snip a small corner from the edge of the baggie, and pipe the icing in a swirl around the top of the cake. Serve immediately and enjoy! You need that cinnamon roll flava, stat, so whatcha gonna do? Make these! Got a wicked craving that ya need to curb quick? Yeah, we get it. 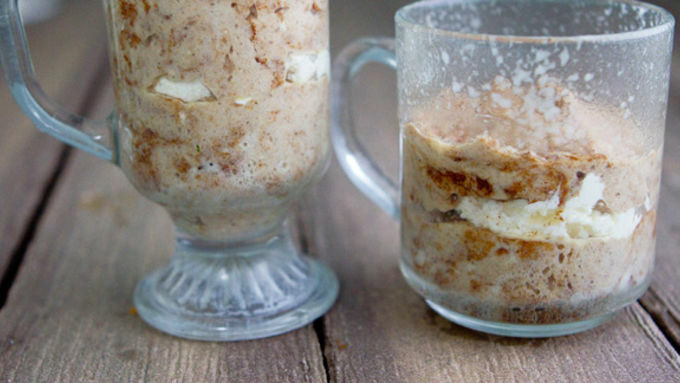 Which is why we're cooking up cinnamon bun mug cakes…in the microwave. 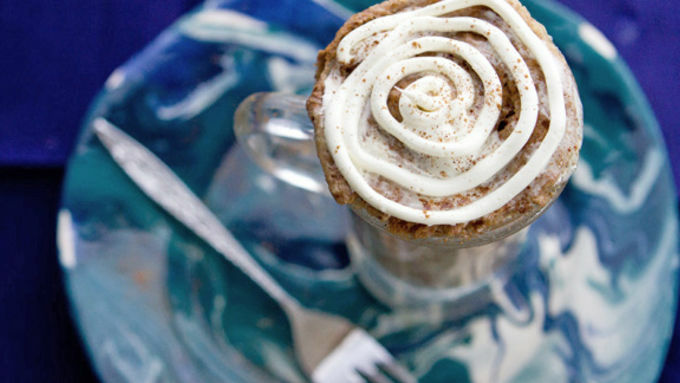 Three minutes and you'll have a hot mug of love, oozing with cream cheese icing and swirled with oodles of cinnamon. So, I came across Cooking Classy's superfab Cinnamon Roll Mug Cake and found it so brilly, I decided to make one of my own. I went ahead and added a few twists to the original. 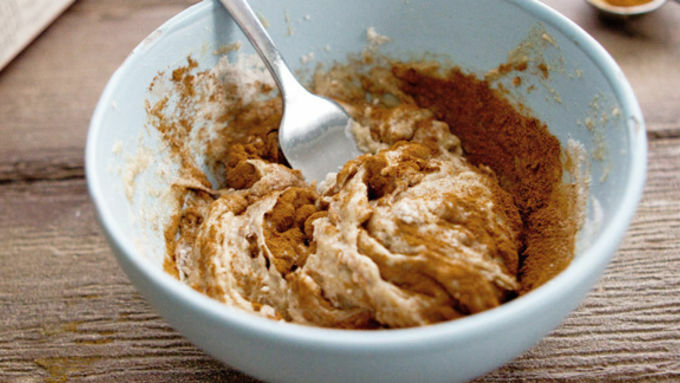 It's easier than ever with ready-to-go Betty Crocker spice cake mix. And maybe we added a middle layer of icing. 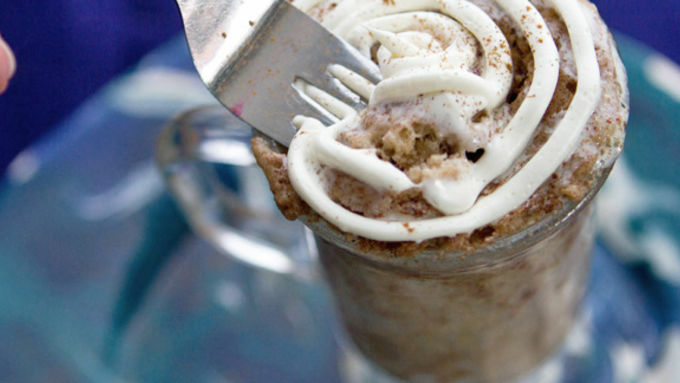 Because what every cinnamon roll needs is a second layer of frosting, ya dig? This is such a fun recipe because you can make one serving at a time, then save all the fixings for later, and make another one (or two! or three!) whenever you choose. Simply zap it all in microwave for 2 minutes (or maybe a little longer, depending on your microwave). You'll know it's done when the cake rises toward the top of the mug, and the center springs back when touched lightly. Put some icing on top and serve immediately!